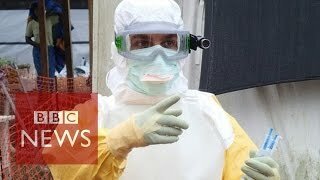 Dr Javid Abdelmoneim wore special goggle cameras to record his time at an Ebola treatment centre in Sierra Leone - here he carefully removes his protective equipment. Related posts: WHO: Ebola Crisis ‘Vastly Underestimated’ Africans Claim U.S. Created Ebola Crisis ; EBOLA TO OBAMA: Nina Pham Ebola HOAX Exposed! Kill Ebola Now. Ways to protect you and your family from the Ebola virus outbreak. BBC Minute: What's the biggest killer of young children around world?